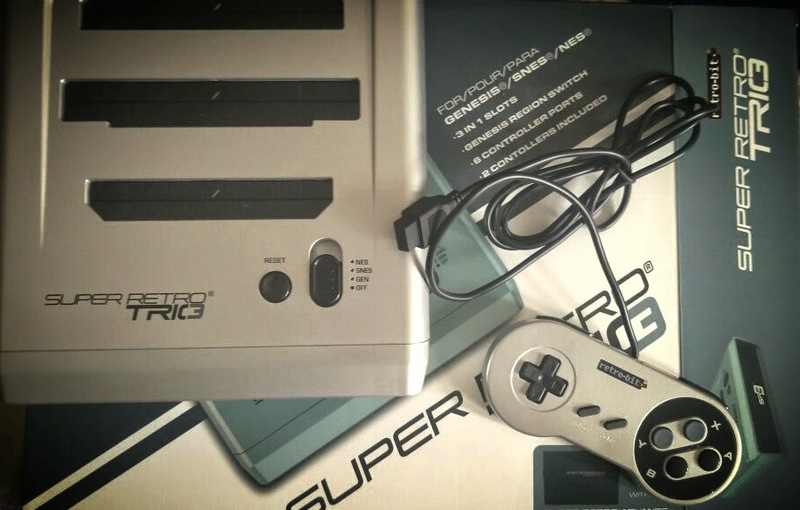 Review of Retro Trio - Weekend deal exclusive to GYL fans. What you get is quite a nice looking console, I have the silver and black model, there is also a red and black version. The top of the unit sports 3 cartridge slots from the back coming forward NES, SNES and Megadrive/Genesis, in front of these are a reset switch and a power/slot selection switch. On the front a push releases the cover for the controller ports, here you can plug in original controllers 2xNES, 2xSNES and 2xMegadrive/Genesis. The 2 included controllers plug into the 9 pin Megadrive ports but are shaped like SNES controllers just to keep you on your toes! The bundled controllers are actually very decent and for that reason will probably see a fair amount of use, the buttons and d-pad give a very similar feel to those on my original controllers. Also behind this front cover is a selector switch for the controllers in use and a region switch for Megadrive/Genesis games for those with region protection. As mentioned there is a cover/door so you can unplug your controllers and close it up to keep things looking all neat and tidy when not in use. Finally round back there are the DC in socket, S-video and A/V ports. The provided power adaptor has a US plug but does not require a step down converter and an UK adapter was provided for me. My TV had some issues with the video signal through the A/V (this is not exclusive to the SR3 – I've had this issue in the past!) so I use a cheap A/V+S-Video to SCART adapter and it works fine for me. Now, the big question – compatibility! I don't have a huge pile of carts to test especially on the Nintendo side of things so here's what I have tried all work unless otherwise specified. That's all I've tested on it so far I'm afraid, I need to acquire some more NES and SNES games to try out but it seems to be fine with every Megadrive game I've thrown at it. There is also a Super Retro Advance Adapter (sold seperately) that allows you to play GBA games as well. In conclusion I'd say it's really good value for what you pay, it looks nice and doesn't look out of place under the TV, the controllers are decent, it might not have all those fancy features or HDMI but it is available now and cheap enough to be worth a shot. Thank you too Jamie Gunn (@highlandboarder) for his time and review!